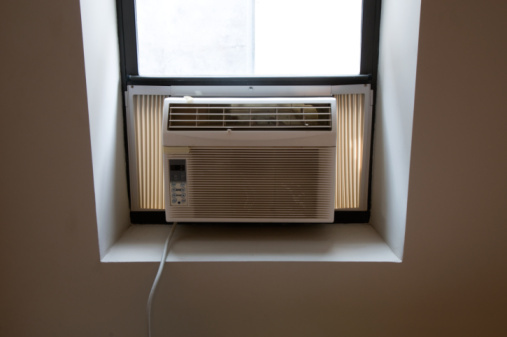 A window air conditioner can be mounted into a window or a hole in a wall as long as you build a mount for it. An air conditioner mount must be wide enough to support the bulk of the unit, while maintaining external supports to offset the weight. This project involves creating three aspects for the mount: the shelf the unit will sit on and two triangle-shaped support beams. Window units sitting in sliding steel or wood windows do not need support mounts. Place the sheet of plywood on top of the unit. Trace the outline of the unit onto the plywood. Place the plywood onto a flat surface and cut out the outline using a circular saw. Measure the width of the sheet of plywood. Cut a 1 inch by 4 inch piece of wood to the width of the plywood. Set the 1 inch by 4 inch piece of wood on top of the plywood so that the 1-inch edge touches the face of the plywood and the 4-inch edge is flush with the edge of the plywood and runs along the width of the sheet. Clamp the edges with 90-degree corner clamps on each end. Turn the structure over so that the 1 inch by 4 inch wood plank is beneath the plywood sheet. Drill 1/8-inch pilot holes through the plywood into the edge of the 1 inch by 4 inch wood plank. Drive 2-inch self-tapping wood screws through the plywood into the wood plank with a drill and screwdriver drill bit. Countersink the tips of the screws so that the heads sit just beneath the surface of the plywood. Measure and cut two 2 inch by 2 inch wood beams to 8 inches long with a miter saw. Measure and cut two 2-inch by 2-inch wood beams to 6 inches long. Adjust the angle of the miter saw to 45 degrees and cut a 2 inch by 2 inch wood beam to 8 inches long with the angle ends pointing toward the center of the wood beam. One edge of the mitered cut will be longer than the other. The longer side must be the 8 inches. Attach one 8-inch piece to the 6-inch piece with the end of the 6-inch piece pressing against the side of the 8-inch piece. The edge of the 6-inch piece must be flush with the end of the 8-inch piece, forming an "L" shape. Drive a 3-inch screw through the top of the 8-inch piece into the end of the 6-inch piece. Repeat for the other 8-inch and 6-inch pieces. Press the mitered 8-inch piece against the "L" shape to make a triangle. Drive a 3-inch screw through the outside of the triangle into each end of the mitered piece. Repeat for the other "L" shape and mitered piece. Insert the plywood platform into the window or wall opening so that the 1 inch by 4 inch lip rests against the frame or interior wall. Press the triangle support mounts firmly against the base of the platform and the exterior wall. Drive three 2-inch screws through the plywood platform into each top of the triangle supports. Place one support 1 inch to 2 inches from each side of the platform.